This article, written by Adelphian Graduate, Evelyn Lutz, was printed in the Tri-County Times, Fenton, MI in July, 2001. Click the thumbnail images to view a larger version. Campmeeting for Michigan Seventh-day Adventists was held at Alma in 1902. Clifford Soule, who lived on Fish Lake Road for many years and was a member of the Holly congregation, recalled a denominational business session which took place during the Alma encampment. It was decided that the growing Michigan Conference should be divided into three sections--East, West and North. The eastern section included the area with Saginaw-Bay City on the north, Lansing to the west and state boundaries on the east and south.In the summer of 1904, the East Michigan Campmeeting was held at Thread Creek Park in Flint. During a business session there, a resolution was adopted that the conference should "take immediate steps to raise $5,000 for the purpose of establishing an Academy" in southeastern Michigan. and it was decided to purchase the farm and start the school as soon as possible.The East Michigan Banner was the church's official organ for southeastern Michigan. An article by Slade in the issue dated Nov. 23, 1904, is entitled "Location of the Industrial Academy." It explained the reasons for the choice of the Holly property and the financial arrangements. "Holly is within a very short distance of the exact center of the Conference" it reads. "It affords splendid railroad privileges and mail service, having seventeen passenger trains daily. . . The Lacy farm of 77 acres is aon a very nice road, one mile west of the town. it is crossed by the Shiawassee River, a small but very pretty stream. "There is a very large house on the farm, which is located in a nice grove of maples. (The house was located about where the west end of the present Holly Academy building is now.) it was stated by the owner that the house was built at an expense of nearly $6,000. "The account explains that the property could be purchase "on easy terms, for $4,500, with the understanding that the city will furnish us electric lights and a telephone for a term of three years, and they will run a water main out to the property thus giving us perpetual fire protection and water service. "Before a deed to the property could be secured, it was necessary to pay $1,500 in cash. School furniture was also needed. Slade urged Adventist members to donate funds for these expenses so it would not be necessary to go into debt. "The people at Holly give us a very warm welcome," he said. "Let us put our shoulders to this work in earnest. 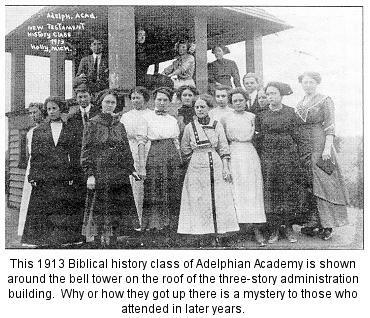 "Named Adelphian Academy (which means "brotherhood"), the new school opened on Jan. 16, 1905 with six students. Others were gradually added until 17 students were present when the term closed in May. The Lacy farmhouse provided living accommodations and classrooms for the first term. 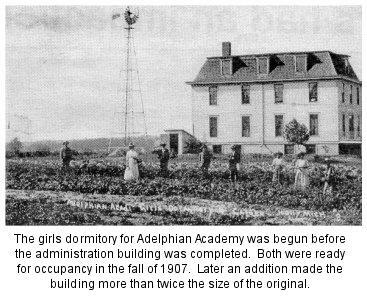 Adelphian's first full school year, 1905-06, found the Lacy farmhouse filled to capacity with girls and some faculty members, so a neighboring farmhouse was rented for the boy's dormitory. it was located about where Adelphian Junior Academy is now.A temporary 54-by 20 foot building was erected just east of the farmhouse as quarters for the principal and his wife, Prof. and Mrs. Lamson and offices and classrooms. Covered with tar paper, that building was familiarly known as the "Black Chapel." Unfortunately, the rented house burned to the ground in February, 1906, and the boys had to crowd into the attic of the "Black Chapel" for the remainder of that school year and the next.Sisters Ethel Dean Tabor and Iva Dean Alkire, who attended Adelphian Academy the second year it was open, visited Holly in the 1950s and reminisced about their school days. They lived in the Lacy farmhouse. "We girls had little stoves in our second floor rooms and carried up the wood to burn in them, " said Ethel. "Everyone ate at two big tables in the dining room. It was just one big family. "Iva recalled that the summer before her last year at Adelphian, she earned the money for her tuition by picking and selling huckleberries from her father's marsh. She strapped a bushel basket over her shoulder and shook the berries into it. She picked out the green berries and used a fanning mill (made for cleaning grain) to take out the dirt and leaves. "I got five or six cents a quart," Iva said, "but I earned $150 and that was enough to buy a few clothes and pay my tuition -- it was $13 a month then. "When school opened for the fall term in 1907, two new buildings were ready for occupancy. The administration building on the east side of the campus housed offices for the academy and the East Michigan conference on the main floor, a chapel and classrooms on the second floor and the boys dormitory on the third floor. The girls dormitory, on the north side included guest rooms on the main floor and the kitchen and dining room in the basement. Mina Pierce, long-time Holly resident, was secretary-treasurer of the East Michigan Conference at the time the Lacy farm was purchased and the new academy buildings were built (See related article).For the first few school years, Adelphian Academy offered grades 7-10, with no mention of lower grades. In the "Fifth Annual Calendar" of 1908-1909, it reads, "The primary department, composed of the first six grades, will be taught by a competent teacher...Grades seven and eight are conducted in connection with academic work. "Between 1909 and 1916, the 11th grade was offered as "overflow" for those who had completed the 10th grade, but graduation was still from the 10th grade. Occasionally 12th grade courses were offered, but not until 1916-1917 was the full 12th-grade curriculum offered and required for graduation. The annual Adventist campmeeting as held at Holly for the first time in the early fall of 1905. The Banner stated "The citizens of Holly have shown every courtesy that could be expected and have assisted us in securing very pleasant and favorable grounds along the bank of the Shiawassee River, right within town, for which we are thankful. "Life-time Holly resident, Vera Cook Husted, remembered that the camp was in "Peck's pasture" (by the Shiawassee River, west of the railroad tracks and south of Academy Road). Area residents, including Mrs. Husted's mother, rented rooms to many who came to attend the meetings.According to the Banner of Aug. 19, 1906, that year's campmeeting would be "in the same place as 1905," (Peck's pasture) and that the village would install electric lights and furnish water "just as it did last year."Mrs. Fred Patterson, whose husband was publisher of the Holly Advertiser for many years, reported on the 1906 campmeeting.Part of that report read: "The camp is very tastefully arranged. About 100 family tents are pitched and many campers are rooming in houses nearby. Probably 500 people or more are in attendance at the regular sessions."Mrs. Patterson as to see that figure far exceeded in campmeetings yet to come. From the summer of 1907 until 1931, the annual Adventist campmeeting was held on the Adelphian Academy campus. Enrollment at the new school continued to grow and by 1911, the school needed to use the space formerly occupied by the East Michigan Conference offices. For several years, the conference offices were housed in various dwellings in the community. 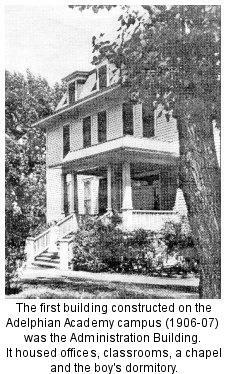 At one time, they were in the two-story house still standing on the north side of Academy Road, west of the Shiawassee River.According to the "Third Prospectus" of Adelphian Academy, printed in April, 1907, that house was built during the previous school year by the carpentry class. The Nov. 22, 1905 issue of the East Michigan Banner says it was being built for the conference president, E. K. Slade.